A common situation many users face when dealing with digital documents is having to convert PDF files to other formats such as Word, JPEG, TXT etc. Fortunately, there are a bunch of PDF converters out there that can get the job done, though finding the best one can become tedious at times. Cometdocs for desktop brings the conversion features to Windows. The tool makes document conversion a breeze, thanks to its context menu integration. And besides converting PDF to many other formats, it also lets you easily create PDFs out of other files. For those unfamiliar with Cometdoc’s web service, it provides 1 GB of free storage space that you can use to host files, in addition to the ability to convert documents between different formats. You need to create an account with the service before you can use all these features. The desktop application also requires you to create a Cometdocs account first, if you don’t have one already. Upon launch, Cometdocs for desktop asks you to sign in with your account; just input your email and password credentials, and click Sign In. The tool then begins running in the background. Converting PDF files to other formats using Cometdocs is dead simple. 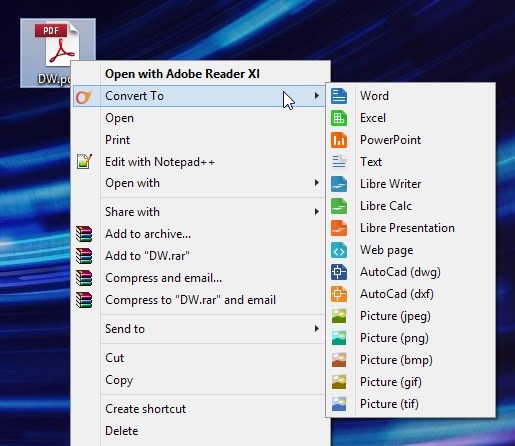 It creates a ‘Convert To’ submenu in the context menu of PDF files. To convert a PDF to any of the supported formats, simply right-click your desired file and then hover your mouse over the Convert To submenu to see a list of supported formats. You will be amazed to see how many output formats this tool supports, including Microsoft Office files (Word, Excel, PowerPoint), TXT, LibreOffice files, AutoCad (DWG, DXF), and image files (JPEG, PNG, BMP, GIF, TIF). All you have to do is click your desired format, and the application will do the rest. The application is available free of cost and works on Windows XP, Windows Vista, Windows 7 and Windows 8.